I lost my companion kitty (Lil’ Bear) of 18 years while I was on business in Switzerland. I was devastated and felt so far away from her. I went to the beautiful rose garden park that overlooks Bern, Switzerland. I cried and cried - I was all alone and far away from her. People were at the park admiring the blooming roses and reflecting pools. An elderly German lady approached me on the bench and asked me in her broken English why I was crying. She wore a t-shirt with the word “Free” across the chest. I told her the reason and knew then my Lil Bear was free from her recent illness. The woman traveled many miles by bus to visit the garden that day on a last minute decision. She bought me tea in the garden. Her name was Hilde Thimms and I knew it was God comforting me. 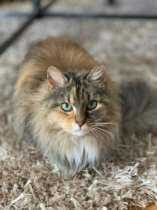 Hilde was such a very special kitty in every way..Beautiful inside and out. She never changed her demeanor no matter what was going on with her or her mom...She will be missed tremendously..